A friendship that defies a tsunami. Vardena (aged 67, left) and Gautebaggse (aged 61, right) are life long friends. 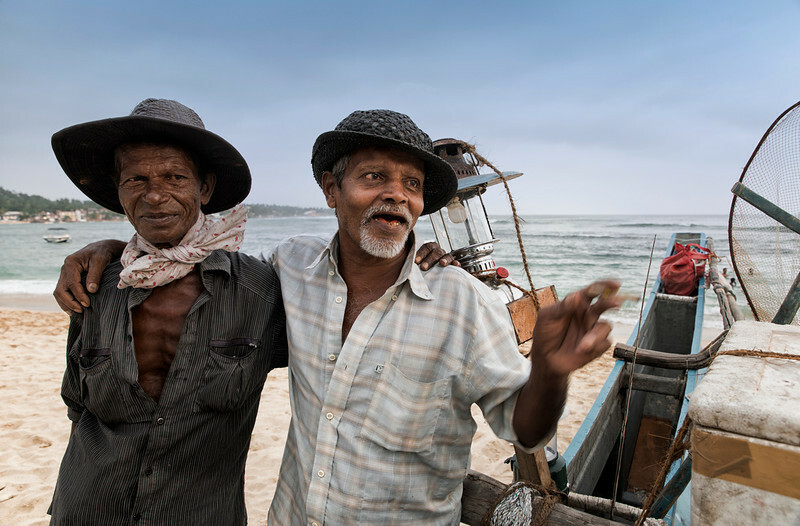 Vardena (aged 67, left) and Gautebaggse (aged 61, right) are life long friends who have grown up together in the fishing town of Unawatuna. Fishing together everyday for the last thirty years, they only stopped when in 2004 the devastating tsunami destroyed their boat. The boat was not the only thing they lost to nature. They both lost their homes, friends and relatives, but Vardena was to suffer even more. He also lost his wife and son. In time, an aid organisation provided the men with another boat which they have lovingly named Corinthe. The once small fishing village of Unawatuna has now been transformed into a tourist destination, but the two friends continue to be a regular sight at the beach every afternoon. Here, unconcerned sun worshippers indulge on their sun beds oblivious to the inspiring and heart warming real life story unfolding just metres away. As the sun sets behind the emerald sea, the two friends push their wooden boat into the water. They raise the sail and set off on yet another twelve hour long shift, many kilometres away from the small flickering lights of the hotels in the distance. Most of the night is spent sitting on a thin, wooden stick that serves as a seat in the meter wide fishing boat. A gas lamp intending to attract squid provides just enough light to be able to see each other, but also enhancing the darkness in the distance as the light falls away from the boat. Sharks almost as long as the boat sometimes appear, attracted by the light. Gautebaggse, the most talkative of the two, explains how he thanks God that the sharks in these waters are not aggressive, or else they could break the boat in half with one bite. As the first rays of sun envelop the boat, the two friends head back to the deserted beach. No tourist in sight yet. And as they head home with a modest catch in plastic bags they give thanks to the Ocean which they have now forgiven, for they understand that what nature gives, nature can also take away. Tea plucker, Ella, Sri Lanka. Every photographic situation has its own difficulties, and photographing the tea pluckers of Sri Lanka was no exception. The good thing is that these people are genuinely friendly and helpful so dealing with them was not much of a problem. Of course the language barrier is always going to stand in the way, but a smile and some hand gestures can work wonders. The main obstacle to me was their working hours. By the time they get ready, sign up for the day’s work and make their way to the plantation, it’s already around 9 am and the sun is too strong. They don’t normally work too late, and usually by the time they head back home the sun is still high in the sky. The high mountains around some of the plantations can also complicate matters. If one waits for the sun to set behind the mountains then the contrast between land and sky is too harsh. I found that the best way for me to work around this was to contrive an image where I could have more control of the light. My first step was to take a walk into the village where the workers live. The environmental sanitation conditions are generally very poor, so care must be taken not to offend by waving money around. Tea pluckers earn approximately £2 a day, and must collect 18kg of tea leaves, so therefore most of them are more than willing to earn double that to have their picture taken. Once a model was found and a price agreed it was time to head to a nearby location. Here I set up the off camera flash with an umbrella and set the power to overexpose a little. I then underexposed the camera a couple of stops, and waited until the sun was just about to hide behind the mountains. The underexposed, ambient light made sure that the detail in the sky was recorded while the overexposed flash captured the model and made certain that she stood out from the background. By shooting in RAW I allowed myself enough information in the file to be able to then further enhance the effect in post processing. If you have any questions about the post, Sri Lanka or photographic tips, please do not hesitate to ask.